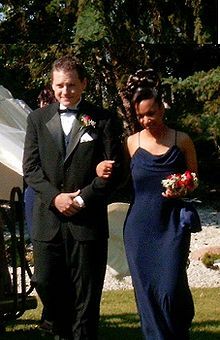 Groomsman in black tie and bridesmaid in evening gown with spaghetti straps. A spaghetti strap (also called noodle strap) is a very thin shoulder strap used to support clothing, while providing minimal shoulder straps over otherwise bare shoulders. It is commonly used in garments such as swimwear, camisoles, crop tops, bras, sundresses, cocktail dresses, and evening gowns, so-named for its resemblance to the thin pasta strings called spaghetti. This page was last edited on 25 February 2019, at 05:33 (UTC).